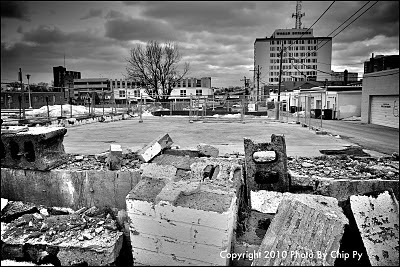 Chip Py, photographer and friend of JUTP, sent us this photo of demolition work on Thayer Avenue for Studio Plaza, a mixed-use development in Fenton Village approved by the Planning Board (PDF!) last spring. This site was formerly home to record store Roadhouse Oldies (which has since relocated a block away) and a handful of other small shops, seen here in a photo taken with Jerry McCoy of the Silver Spring Historical Society. 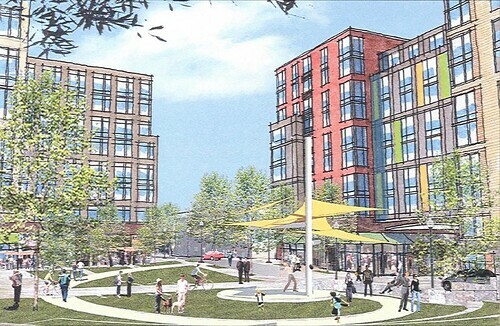 Located on a five-acre block bounded by Fenton Street and Thayer, Silver Spring and Georgia avenues, Studio Plaza will have a hotel, up to 600 apartments, offices and retail, along with a third-acre public green, pictured below. While redevelopment often means loss of neighborhood character, it's good to see that at least one local landmark wasn't completely displaced. Studio Plaza is just one of the really exciting new projects going up in Downtown Silver Spring, and I know I'm not the only one looking forward to seeing it happen one day. Is this new demolition? Or just the first time you are seeing it? Some of that site has been demolished and fenced in for (seems like) about a year. Disregard, I now see the large demolition equipment in the background and the snow on the ground so it must be very recent. EXCELLENT!! Roger, I shot that photo last Sunday mornin. Feb 28th.